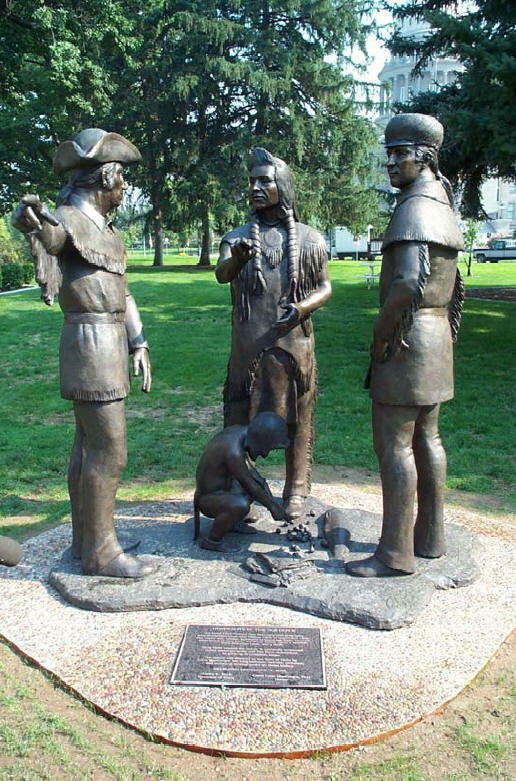 The "Hospitality of the Nez Perce" is a replica of a statue found on the campus of Lewis-Clark State College in Lewiston, Idaho. The sculpture in artful detail depicts Meriwether Lewis in a three-cornered hat and his colleague William Clark wearing a fur cap. An animated Nez Perce tribal chief, Twisted Hair, motions to the west and a perilous waterway that would transport the explorers to their destination - the Pacific Ocean. At their feet, unaware of the historical significance of this first encounter, Twisted Hair's young son Lawyer is enthralled by the elements of trade, a few fish, and some camas root. Artist and sculptor is Doug Hyde, a descendant of the Nez Perce Tribe and resides in Santa Fe, New Mexico.